I just made this delicious summer salad, first posted by Elizabeth Rider at Whole Living Blog and reposted by Alina at My Yellow Umbrella. Thanks ladies! 1.Combine all dressing ingredients in bowl and set aside to allow the garlic to diffuse. 3.While the quinoa is cooking, chop the red bell pepper and green onion into small pieces. 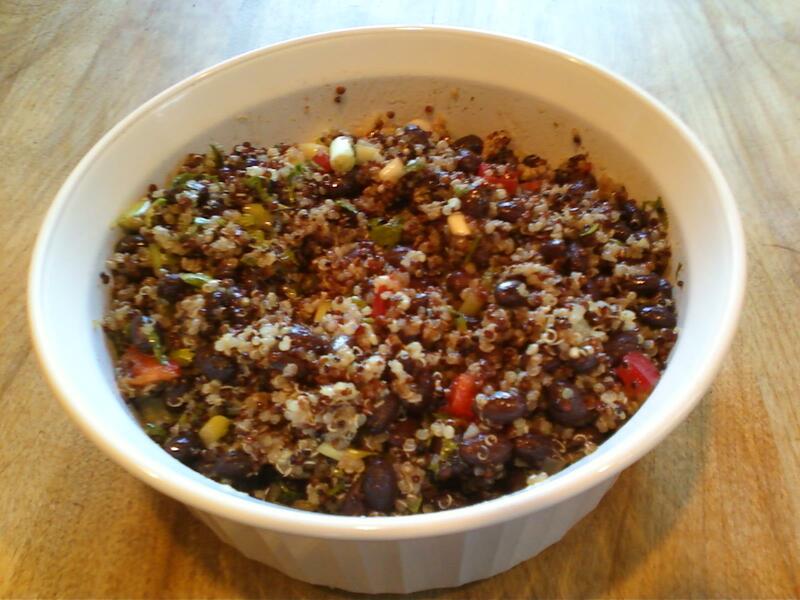 4.Drain and rinse the black beans. Make sure to give them a good run under the water and drain out completely. 5.Give the cilantro a medium chop. I substituted a mixture of white, red & black quinoa and used honey because that’s all I had on hand. I also only had 1/2 of a red pepper, but it still tasted excellent.